As we mentioned late last month Carphone Warehouse is set to launch its own mobile network. The iD network will launch tomorrow and there are some preliminary details of roaming, tariffs and mobile contracts already available. As we heard before, iD is a mobile virtual network operator (MVNO) based upon the Three mobile network in the UK. However it was intriguing to hear that Carphone Warehouse is aiming to best Three's 'Feel at home' roaming by providing even more countries in its 'TakeAway' plans. It turns out that iD will offer free frictionless roaming 22 countries, that's four more than Three offers. 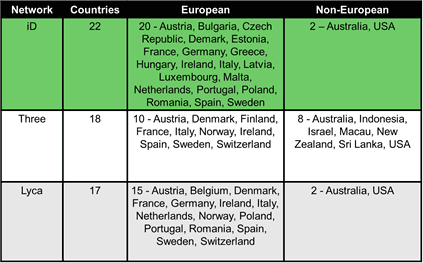 A table showing the roaming comparison between iD and Three is shown below. 'GoTo' plans provide so called 'generous' data allowances and cost from £12.50 pm on a 12 month contract or £11.50 pm for a 2 year commitment. 'ShockProof' plans start at £7.50 pm with a £5 buffer to prevent bill shocks if you use more than your allowances. Finally iD 'SIM only' plans start at £5 pm for a data-only 30-day tariff rising to £7.50 pm with some calls and texts bundled in. If you pay as much as £20pm your SIM only will include 2000 minutes, 5000 texts and unlimited data. There will be two 'limited time' promotions to launch the iD network tomorrow. As well as the offer we learned about last month, of a Samsung Galaxy A3 smartphone with 300 minutes, 5,000 texts and 1GB of 4G data for £19.50 pm over 12 months, there will be an entry-level offer. The cheaper offer is of a Nokia Lumia 635 on a 24-month plan with 150 mins, 5000 texts and 250MB of data for £7.50 pm. Now we have more details of iD's upcoming tariffs they sound a bit less interesting to me, personally. While the 'TakeAway' countries are extensive it requires a long, expensive commitment – meanwhile even Three PAYG users can take advantage of 'Feel at home' free roaming. This doesn't sound like giving customers the ability to "tailor their price, minutes and data to their changing needs," as put forward as a strategy by Carphone Warehouse back in February. However with just a day left to launch and proper tariff breakdowns and pricing tables being published - we shall see. Disappointing but the prices are ok. Just wish the lumia deal (The cheaper offer is of a Nokia Lumia 635 on a 24-month plan with 150 mins, 5000 texts and 250MB of data for £7.50 pm.) came without the phone and double the data (it could have less minutes too). Was really hoping for the ability to pick x minutes, x texts and x Mbs for x… Guess I'll need to take a good look round when my current contract comes up in a few months as Sim only deals <£8 seem to be drying up. Lost total confidence in CPW. They have got worse since the merge. Three- £22 a month for 600 mins unltd data and loads of useless texts…….. This was a retention deal for a customer thats been with three since the start, not even 2000 3 to 3 mins they used to bundle. My dad was paying £13 a month for 500 mins unltd data, and 2000 3 to 3 mins. I was expecting a price increase but that much…..